God bless So Delicious! Because after swearing off the regular ice cream I used to indulge in each weekend (I miss my local ice cream parlor, but the dairy was too much for this stomach, even with supplements to help with the lactose intolerance), I can now have my indulgence back. Yes…yes I can. And in so many different varieties for a base. Soy milk, coconut milk, almond milk, cashew milk…they have a little bit of everything. But I’m currently on the biggest cashew milk kick. Seriously. It’s the companion to my cereal in the morning…a creamy addition to my overnight oatmeal…a key component to my dairy free (and creamy) gluten-free and vegan macaroni and cheese. I love it more than soy milk, more than coconut milk, more than almond milk…and it seems to be holding true for the frozen items as well. Then again, So Delicious has yet to really disappoint me with any product I have ever ventured to try of theirs. It is one very trusted brand in my book. So, with temperatures soaring outside this weekend, my roommate and I were cooking in and treating dessert as our cool down. So, Saturday evening, after a simple and delicious dinner (after a long day of shopping and buying groceries and other such weekend sundries), I pulled the pint of So Delicious Dairy Free Salted Caramel Cluster Cashew Milk Non-Dairy Frozen Dessert out of my freezer. It was the other flavor of the new cashew milk frozen desserts that my roommate and I splurged on one day while out grocery shopping. I already reviewed the Snickerdoodle flavor. While we ate, I allowed it the 10 minute defrost time, which is common with non-dairy frozen treats, so that it was scoopable. Then, after clearing and washing dishes up…it was time to unveil the ice cream that awaited us. I eased off the lid and pulled back the white plastic that sealed in the freshness. I saw an amazing looking white ice cream, speckled with dark chocolate chunks and swirls of golden caramel. 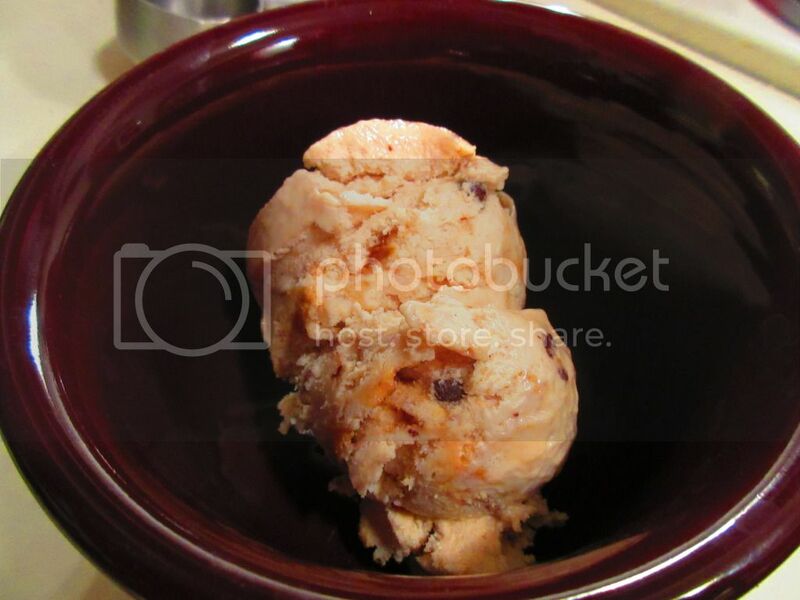 I got out the ice cream scoop and easily dished up two servings into the ice cream bowls I had dug out of the cabinet. Delivering one to my roommate, I returned to the kitchen to tuck the pint back into the freezer. By the time I took up my own bowl, Cathy had already taken a taste of hers. Well…that was all I needed to hear. MY spoon touched the scoop in my bowl, dug in, getting a little bit of everything, and then was introduced to my taste buds. It tasted like a smooth, creamy, rich…butter pecan (minus the nuts) base with a burst of amazing sweetness from the dark chocolate covered cashews. Those, I think, were my favorite part. But this ice cream definitely enhanced all the taste senses. Salty and sweet, it was a perfect blend of flavor and richness. I loved how the caramel ribbons were soft and accented the cashew milk base and the dark chocolate covered nuts that were scattered throughout the pint. They were little bites of joy, for sure. And I happily devoured each bite. My only complaint, and this is a personal one, was that there weren’t enough of the dark chocolate covered cashews for my liking. If these “clusters” are going to be significant to the name of the ice cream, be sure you load your pint down with them. It was a hide-and-seek game with the scoop…but I managed to get these tasty morsels into each serving for both myself and my roommate. Let’s talk about what So Delicious Dairy Free puts into their Salted Caramel Cluster Cashew Milk Non-Dairy Frozen Dessert, shall we? 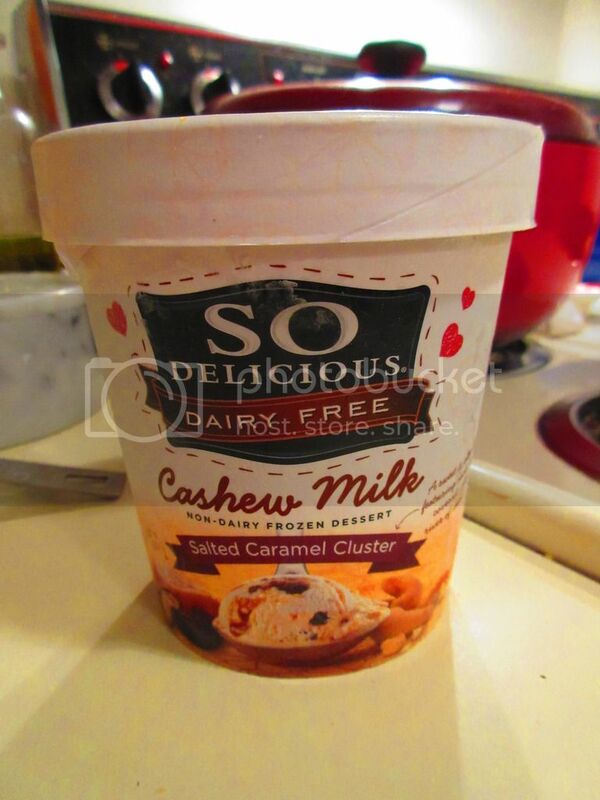 This ice cream flavor is made from cashew milk (water, cashews non-GMO canola oil), organic dried cane syrup, chocolate coated cashews [coating (cane sugar, coconut oil, cocoa (processed with alkali), chocolate liquor, natural vanilla flavor), roasted cashews (canola oil, safflower and/or sunflower oil, salt)], caramel sauce [organic tapioca syrup, water, molasses, pea protein, natural flavors, organic cocoa butter, sodium citrate, salt, pectin], natural flavor, sea salt, fair trade vanilla extract, gum acacia, and guar gum. It is gluten-free, vegan, cholesterol free, free of trans-fats, and non-GMO. As far as nutrition goes…aside from being a dessert and an ice cream treat at that, this is actually quite impressive and not half bad as far as the data goes. One serving is 1/2 cup and there are 4 servings in each pint. One serving will provide you with 180 calories, 9 grams of fat, 130 mg sodium, 18 grams of sugars (YIKES…but then again…ice cream! ), 24 grams carbohydrates, 1 gram of fiber, and 3 grams of protein. As tempting as it is to devour the entire pint in one sitting, definitely savor it and eat only the serving. It’s okay to treat yourself to a nice, cold, delicious treat and when you do…if you can’t handle dairy like me…then So Delicious has you covered for sure. And…I am a HUGE fan of the new cashew milk frozen desserts. I can’t wait to try the three other flavors! Oh…yeah…it was polished off Sunday night. Didn’t last long. Never does. This entry was posted in Chocolate, Dessert, Food, Frozen, Gluten-Free, Ice Cream, Nuts, Products, Review, Snacks, Sweet Stuff, Vegan, Vegetarian by The Celiathlete. Bookmark the permalink.